I eventually reached the point where it was time to install the newly assembled engine into the car. Due to my garage layout and equipment, I chose to install the engine from underneath. The front of the car was hoisted up high enough to move the engine under the car, on its cart. 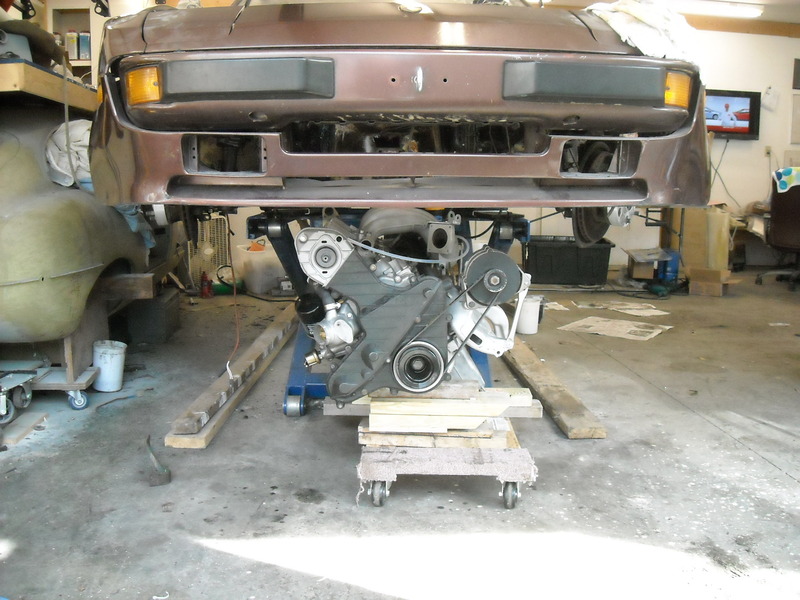 I then lowered the car quite a bit but at some point I stopped the descent of the car and placed it on jackstands and re-attached the hoist (a come-a-long) to the engine. 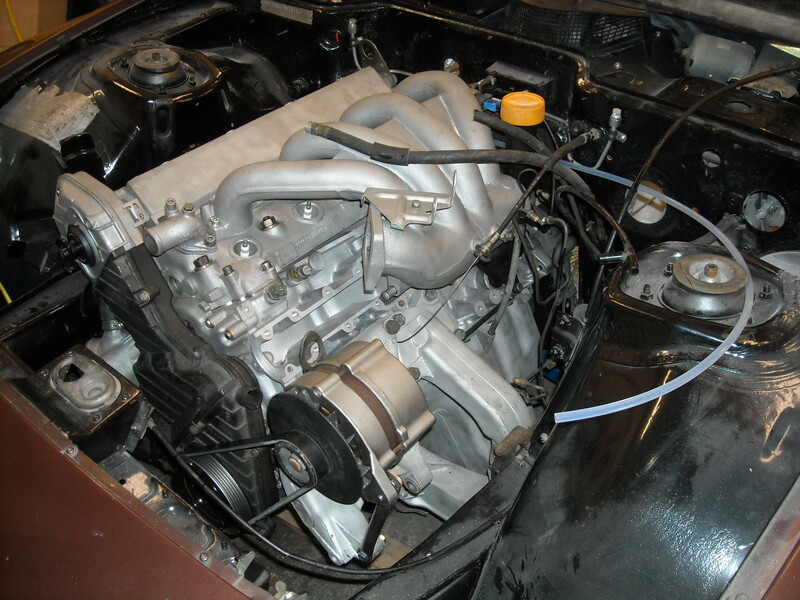 You can have quite a few items attached to the engine such as intake manifold, exhaust manifold, and alternator. The following pictures are deceptively simple. I had a bear of a time getting the engine seated correctly on the shaft from the torque tube. Yes, I used a centering tool when I installed the clutch. But it took forever to get the shaft to line up with the splines in the clutch plate and then even more time getting the shaft to engage the pilot bearing. If anyone has some tips in this regard, please let me know. The clear tube shown in the above picture is coming from a “steam vent” drilled and tapped at the back of the head. This is allowed by 944Spec rules. I bought the kit from Lindsey Racing. The alternator as shown uses the stock bracket for the pivot mounting and a homemade tension adjustment piece. I subsequently realized that I couldn’t use the stock air filter housing with the alternator mounted in this position. I wound up buying a Porsche OEM A/C delete bracket, which mounts the alternator much lower and clears the stock air filter housing. I bought the bracket from Paragon. I can’t remember the specifics right now but something caused me to have to remove the oil filler assembly subsequently to get at something behind it. Obviously, the above photos were taken before I got the car painted! 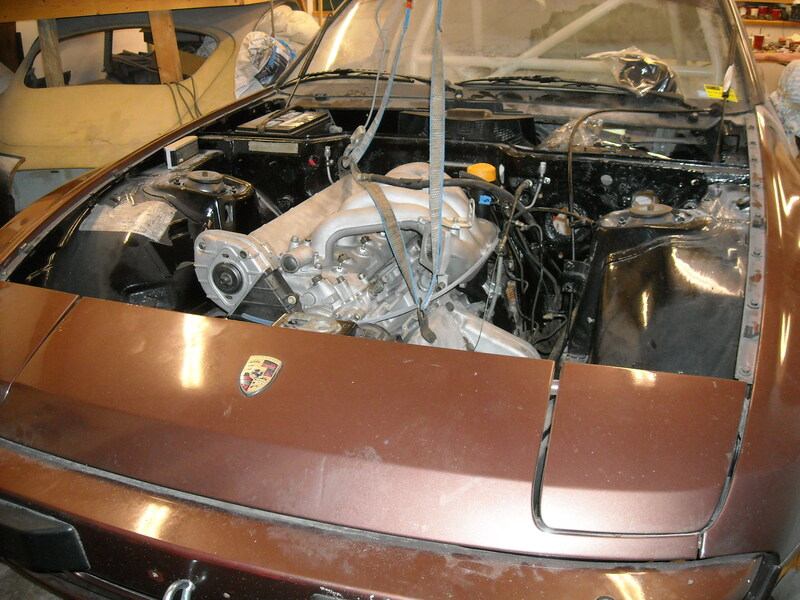 After I got the engine into position, much time was spent getting the wiring hooked up and getting everything in the engine compartment shipshape. But eventually, I reached the point where the engine was ready to fire up. So with some trepidation, I gave it the juice. First I established that it would crank, with the fuel injection disabled. Next I pulled the fuel injection rail and confirmed that I was spraying fuel from all of the injectors. They were firing OK. So finally I attempted to start the car. To make a long story short, the engine would fire, idle badly, then die. I spent a long day checking all sorts of possibilities, with no luck. I went to bed on a Sunday night very dis-spirited. I have a hard time sleeping when there is a problem that needs solving. I remember getting out of bed at 4 am, going out to my parts car, pulling the ECU, and switching it into the car. It fired immediately and ran smoothly! Wow! Oil pressure was good, although there was a horrible racket from the lifters, which went away eventually. I went to work that morning in a much better mood. Reconstructing, I remembered that the previous owner had given me an extra ECU with the car. I had somehow installed that one and it turned out to be bad. Oh well, all’s well that ends well. The next weekend I did another once over on the car and identified a number of small issues to be dealt with, mostly loose bolts in the suspension, etc. I did a rough alignment. On Sunday, I took the car out for its first test drive. I drove it about 1/2 hour with no problems. The next weekend, I took the car out for a more vigorous test drive, on my local backroad test track. This consisted of an hour of heavy acceleration and braking, combined with much weaving back and forth, trying to stress the car relatively close to the house, rather than at the track. The car did fine. I parked it for the week as it was back to work. The following weekend I went out planning to make another endurance run of a few hours. I started the car. WTF, no oil pressure! Being in denial, I let it idle for a few minutes waiting for pressure to build, then thinking it must be a bad sending unit. Note that the car has both a gauge and an idiot light. Both are driven off a common sending unit. I grabbed a spare sending unit off my parts car and tried it no luck. At this point, the car probably had a total of 10 to 15 minutes of idling. Very discouraged I decided to shut it done and mull the situation over.